MICRON POLYESTER FILTER BAGS, China MICRON POLYESTER FILTER BAGS, Quality MICRON POLYESTER FILTER BAGS manufacture by COX Filter Cloth. 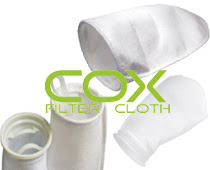 Description COX Filter Cloth high quality Micron Polyester Liquid Filter Bags are made of various materials which provide consistent filtration of liquid in a lot of applications. The filter felt offer efficient depth filtering at increased flow rates,various optional surface trestments are valid to reduce fiber migration and enhance filtration performance. The collars and top rings ensure general compatibility with most commercial bag filter housings in the market. The connection for filter felt and top ring could be sewing or welded,suitable for different housings and purposes. Filter bags extended life time without media migration or bypass. Customized bag filters are appropriate for different requests in many industrial fields. 2, Polyester material of filter felt with O-Rings offer for a lot of choices for application and operating temperatures . 3, Kinds of international and customized sizes fit most industry bag housings . 4, Low cost filter bags provide precision filtration, exceptional strenth and longer service life . 5, Exquisite workmanship and complete quality management system make bag filters have consistence excellent performance. Liquid Polyester(PE) filter bag available from 0.5 micron to 200 micron. Plastic, carbon steel, stainless steel neck material is common used.